Next to Michelangelo, Leonardo da Vinci and Raphael, Caravaggio is now arguably the best known and admired Italian master and yet, but for the inspired and diligent research of art historians, especially Wolfgang Kallab in the late 19th century, followed by Roberta Longhi in the early 20th century, his body of work would not be properly recognised. Only 80, or so paintings are universally recognised as being autographed and not one of them is dated and only one, The Beheading of John the Baptist, in St John’s Cathedral, Valletta, is signed. Scientific study of his work has confirmed that there are no under-drawings, which means that he painted directly onto the canvas, even though, in addition, no preparatory sketches of any type, have ever come to light. Caravaggio was one of the most mysterious and complex personalities ever to pick up a paint brush. Even now, we do not have sufficiently solid biographical information to explain his erratic, dysfunctional, often criminal behaviour, but through his paintings we now understand the transformation that he, almost alone wrought as a reaction to the contrived, exaggerated, mawkish Academic Mannerism of the late 16th century. He lived in violent times, during the Counter Reformation and rather as a film director, he created a new language of theatrical realism and drama, choosing his models from the streets, producing carefully planned reconstructions of Biblical narratives, which told these stories with vivid illusionistic Naturalism that the common man could comprehend. Whilst he may not have been the first painter to exploit the effects of light in painting, his technique of focusing strongly directional light on the subject(s), with associated contrasting deep shadow, now called Tenebrism, was at the time regarded as revolutionary. Almost immediately, contemporaneous painters in Rome, such as Orazio and Artemesia Gentileschi and Giovanni Baglione were employing this new, dramatic lighting in their work and even Rubens, then in Rome, recognised the genius that was Caravaggio. 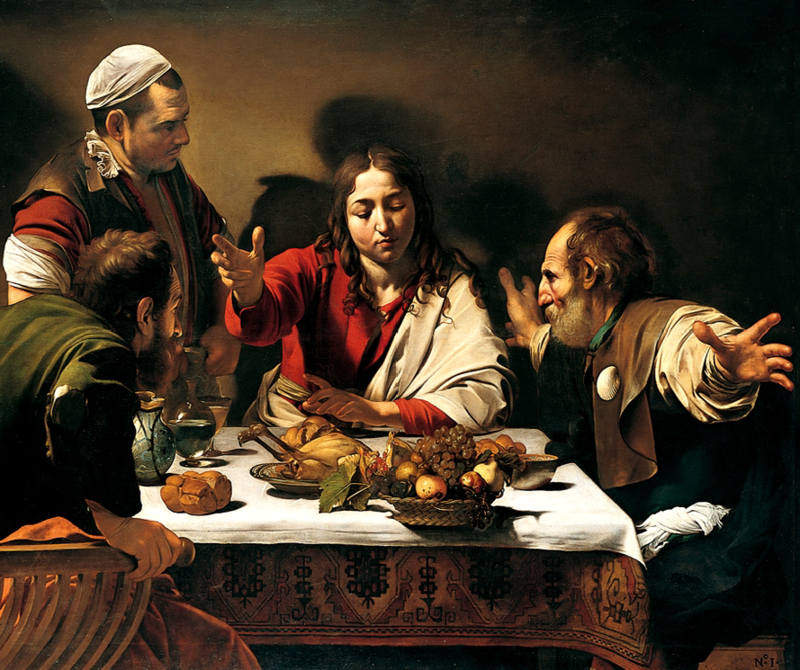 Consequently, successive generations of 17th century painters, from the Spanish painters, Velasquez, Murillo and Ribera to the so-called Dutch Caravaggisti such as Honthorst and Terbrugghen and the Golden Age masters, Rembrandt and Vermeer, all continued to benefit from his discovery, to the extent, that the preeminent Caravaggio art historian, Roberta Longhi, who firmly rehabilitated Caravaggio’s place in the history of art, believed that the art of Delacroix, Courbet and Manet, would also have been entirely different. Please come and join us as over the next few months as together we explore the work of Caravaggio and his legacy.